Ms. Duke was elected Chair of Wells Fargo’s Board of Directors effective January 2018, and served as Vice Chair from October 2016 to December 2017. Previously, Ms. Duke served as a member of the Board of Governors of the Federal Reserve System from August 2008 to August 2013, where she served as Chair of the Federal Reserve’s Committee on Consumer and Community Affairs and as a member of its Committee on Bank Supervision and Regulation, Committee on Bank Affairs, and Committee on Board Affairs. From March 2014 to September 2015, she was an executive-in residence at Old Dominion University. Previously, Ms. Duke also was chief operating officer of TowneBank from 2005 to 2008, and was an executive vice president at Wachovia Bank, N.A. (2004 to 2005) and at SouthTrust Bank (2001 to 2004) which was acquired by Wachovia in 2004. Ms. Duke also served as chief executive officer of Bank of Tidewater, which was acquired by SouthTrust, and chief financial officer of Bank of Virginia Beach. 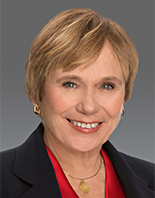 She served on the board of directors of the American Bankers Association from 1999 to 2006, becoming the first woman to serve as chair of the ABA in 2004, and as a member of the board of directors of the Federal Reserve Bank of Richmond.